Does better gum health protect your heart? Gum disease is associated with coronary artery disease. The link between oral health and heart health may seem an unlikely one. But proper care for your teeth and gums may help lower your risk for developing heart disease. 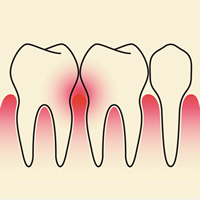 Gum disease leads to inflammation—the immune system's attempt to heal injury. The chemicals produced by inflammation of the gums get into the blood. When they reach the heart, those chemicals may increase inflammation inside plaques of atherosclerosis in the arteries of the heart—thereby increasing the risk of heart attacks and strokes.